Juniors Emmanuel Ayetigbo, JohnPaul Oluwadare and Wesley Robinson are all averaging 11 or more points per game as the Falcons are 9–1 after 10 games for the first time in at least a decade. Juniors Emmanuel Ayetigbo, JohnPaul Oluwadare and Wesley Robinson have been the key cogs behind Burlington Township boys basketball’s 9–1 start in the 2018–19 season. 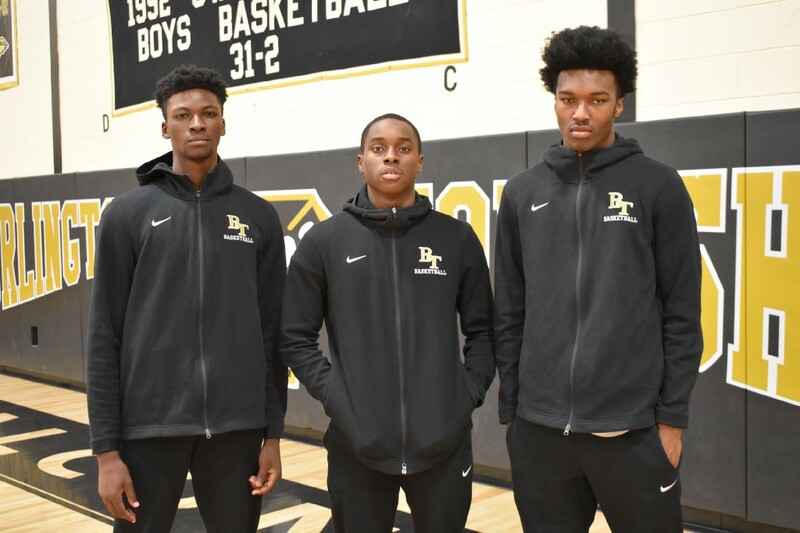 Juniors Emmanuel Ayetigbo, JohnPaul Oluwadare and Wesley Robinson have seen the transformation of Burlington Township High School boys basketball firsthand. When the trio joined the program in 2016, the Falcons had come off three consecutive losing seasons. They would finish with a losing record again in 2016–17, winning just seven games in their first year under head coach Ryan Derry. Now, losing seasons seem to be a distant memory. After a breakout, 15-win season in 2017–18, the Falcons are flying high. Burlington Township won nine of its first 10 games in 2018–19. Ayetigbo, Oluwadare and Robinson are leading the way, with all three juniors averaging double-digit points per game and helping to establish a winning culture. The trio entered Burlington Township’s program as freshmen the same year Derry took over as head coach. All three players say there is a completely different attitude surrounding the team now compared to when they joined the program. “It’s really different, because now we always play together as a team,” Robinson said. The trio began to get more minutes as sophomores in 2017–18 as the Falcons turned the corner with their first winning season in five years. By the end of the year, all three were in the starting lineup and Derry realized all three of them were not only immensely talented, but passionate on the court. Oluwadare is one of the Falcons’ captains and runs the floor as Burlington Township’s point guard. Ayetigbo and Robinson, both standing at approximately, 6-feet, 6-inches tall, are forwards who can give opponents fits inside. All three players are threats to score on any given night and their point totals are very close to one another. Ayetigbo led the team after 10 games with 13.1 points per game. Robinson is second with 12.5 points per game and Oluwadare averages 11.7 points per game. The three players are all committed to the family-first culture Derry has preached over the past three seasons. Oluwadare pointed to Burlington Township’s Jan. 8 win as evidence of this. Oluwadare scored just three points in the Falcons’ 64–43 win over Medford Tech, but he wasn’t concerned about his individual statistics. “It wasn’t a game for me to score, it was a game to get everyone else going,” he said. “We just want to make sure we score more than the other team,” Ayetigbo added, downplaying the importance of individual accomplishments. Derry believes his team is capable of being even more dangerous on the offensive side of the ball as the season goes on, identifying defense as a strength of the team. Derry admits he didn’t think the Falcons’ would win nine of their first 10 games back in the preseason. However, he believes the team’s success has stemmed from the players’ commitment to working hard as well as the family-like atmosphere he has instilled in the program. The Falcons feel they’ve flown under the radar the opening weeks of the regular season despite their 9–1 start. However, Oluwadare believes Burlington Township is on the cusp of establishing itself as a championship contender in Central Jersey Group III this season.